The dictionary defines agriculture as: The science, art, and business of cultivating soil, producing crops and raising livestock. Agriculture has been the dominate industry in Hardin County since it was established in the mid-19th century, although it has evolved and changed over time. The earliest farms were of a subsistence nature, feeding the immediate family. By 1860, 11 mill sites were located on the Iowa River in Hardin County. These early mills processed wheat into flour. Wheat was the chief agricultural product grown; flour was ground for vital domestic food use and for sale to new immigrants and other markets. After the 1850s, it became increasingly apparent to Iowa farmers that more money could be made from corn and other feed grains grown for livestock consumption than that grown for human consumption. The cost of shipping grain to the east was prohibitive, but cheap Iowa corn could be fed to hogs and cattle, which in turn were sold at nearby markets. 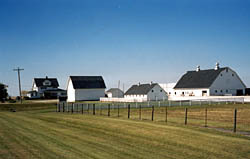 This shift in farming created a new demand for storing large amounts of grain at the farm site, which resulted in the development of the corn crib. On some farms, the corn crib was even larger than the barn. The Civil War created a lull in Iowa's growth and immigration, but the period after the war saw a significant land use change in the expansion of railroads, stagecoach and wagon roads and bridges. Section line county roads were increasingly laid out according to the legal township and range pattern superimposed upon Iowa by the national government land surveys. 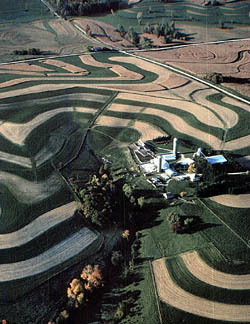 This grid pattern on the landscape has greatly influenced farmstead location and field placement over time. By the late 19th century, the conversion from wheat to predominantly corn and livestock production was nearly complete, and grain elevators on county roads and rail lines rapidly replaced gristmills along the river. These storage and shipping points have evolved into multimillion bushel storage silo facilities. These silos are now affectionately known as the "Prairie Sentinels." 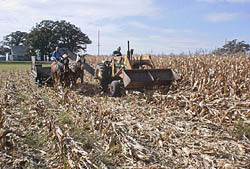 Increased mechanization had a profound effect on farming in Hardin County. The first machines adopted were gas and steam powered engines--used as stationary and mobile power sources for the many chores around the farm. Tractors and motorized harvesting equipment were introduced next. Early tractors were steam powered goliath machines, followed later by gasoline and then diesel propelled models. These tractors expanded the field work capabilities of the farmer. What started as the single blade plow pulled by oxen and horse has evolved into 12 row implements towed behind gigantic turbo-charged tractors with hundreds of horsepower. This mechanization of agriculture was completed around 1970. Another important aspect of the agricultural industry is livestock. This too has experienced major changes over time. In the state's early history, every farm had at least one milk cow, a dozen hogs and several chickens. Today most cattle, swine and poultry are concentrated at a few large industrial operations. The operations consist of large stand-alone buildings, in contrast to the traditional cluster of farm buildings. In fact the size of the barn was often determined by the livestock number, thus dictating the required hay storage as animal shelter is necessary for the Iowa winters. That need is no longer. Iowa's barns continue to stand as emblems of prosperity of past eras as well as the continual changes in agriculture. The barn was the initial center of the agricultural operation before this building became obsolete with the adoption of machines that could perform the same jobs previously done by farm animals. Many barns now suffer from a lack of maintenance, demolition or loss due to wind or fire. From 1830 to 1920, there were an estimated 100,000 barns built in Iowa, 180 of which were round or multisided. Less than half of these barns survive today, and more are being lost at a rate of 1,000 per year. Many concerned citizens are now striving to save and protect those that remain, so that future generations and visitors to the state can experience this era of Iowa history. The use of hybrid seed for commercial production is recognized to be an Iowan's invention through the Wallace family and what is now the Pioneer Seed Company. The idea of purchasing seed rather than using seed carefully sorted from previous year's production changed agronomic agriculture. The earliest seed company in Hardin County was located in Ackley, which is also the location of one of the nation's largest canning facilities. For years this area has been the sweet corn capital of Iowa. The technology of biogenetics for resistance and other production and processing traits makes the requirement of planting commercial varieties nearly mandatory. The importance of soil fertility and its impact on farming is well documented. Fertilization of the soils has moved from animal wastes to commercial fertilizers and has arrived at a blend of the two. Where large-scale livestock operations exist, huge tracts of cropland are covered with manure to aid in the plant production. Where those are not readily available, commercial fertilizers are the application of choice. The basic nutrients from animals or the commercial source are applied according to laboratory information in a closely monitored rate. It is often said that American agriculture is the last great family business to vertically integrate into a corporate structure. Families that used to operate on 160 acres now operate with employees on 5,000 to 6,000 acres and more. The future of American agriculture is one of merging the laboratory and the farmer. Public and private discovery of food technology involving all in the food chain from production to the consumer and the quick acceptance of those discoveries has become the agricultural industry standard. Increasing the efficiency, expanding the utility, developing specific attributes and creating new varieties with specific characteristics define our future. Value-added agriculture, which began with the basic plan of selling grain as meat with grain and livestock production on the single farm operation continues to have validity. Nevertheless, vertically integrated agriculture operations producing a single product are more common. Chemistry, genetics, botany, zoology and their interrelationship creates a new agricultural family that increases the difficulty of defining where the farm gate is located. Additional concerns of food, fiber and energy production offers new challenges for tomorrow's farmer never imagined in history. Our ability of successfully collaborating among all who are involved in the science, art and business of cultivating the soil, producing crops and raising livestock will determine the future of Iowa, this nation and our world as we struggle to feed, clothe and house a population of more than six billion.